When you’re just getting started as a brand new blogger, it’s tempting to take the free and easy route for setting up your site and systems. I know, because I started off on the free WordPress .com platform when I first started blogging. I learned very quickly that it’s important to make a few small investments in your blog so that you can optimize your website, look more professional, and start making money from the get-go. 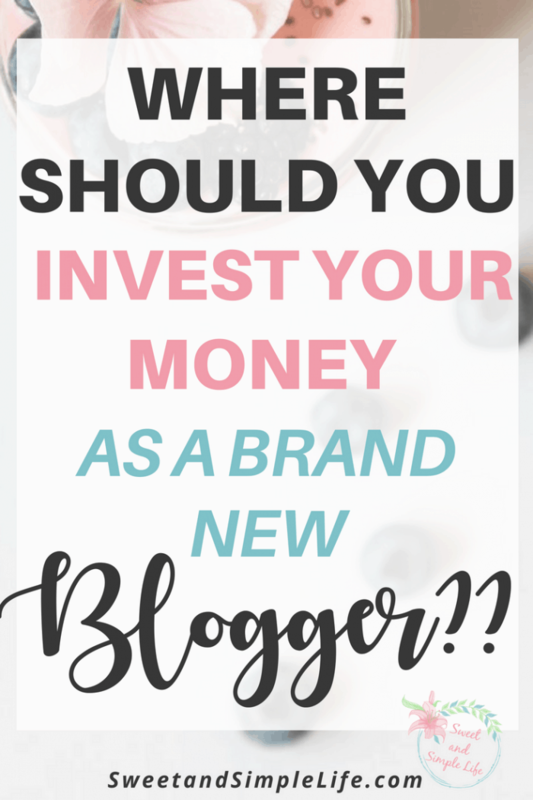 So, what are the essential investments for new bloggers? I’m glad you asked! This post probably contains affiliate links, which means I will earn a small commission if you make a purchase through them, at no additional cost to you. Read more here. There are a few important components to starting a money-making blog. Ideally, you want to own your website, own your domain name, and have some useful tools that help you monetize. When you are deciding where to invest your money for your new blog, I highly recommend focusing on two things. Investing in things that will help you make MONEY from your blog. Investing in things that will help you SIMPLIFY your life and business. Running a successful blog is no walk in the park. It takes time, effort, and strategy to make money. It’s important to invest your time and money in the few things that will actually contribute to your success. Let’s break it down with THREE important investments every new blogger should make. You’ve probably heard this before, but there is a difference between a free blogging platform and a self-hosted website. If you want to be taken seriously in the online business space, you ABSOLUTELY HAVE TO have your own website and domain name. You own the website. If you choose a blogging platform like WordPress .com, Wix, or Blogger, you DO NOT own your website. If you choose a self-hosted WordPress .org website, you DO own your website. You can customize your website however you want. Again, those other blogging platforms are limited because you can only work within the limitations of their software. If you choose a self-hosted WordPress .org website, you have UNLIMITED ability to customize your website. It can be as simple or as complicated as you want. It’s faster and easier to grow your blog! You can use so many awesome plugins to skyrocket your blog growth when you’re on a self-hosted platform. As an example, Yoast SEO is a free and helpful tool for optimizing your content and helping you rank higher on search engines. It’s only available on a self-hosted WordPress .org website. Email subscription boxes and social share buttons are both super easy to install with a simple plugin too. And believe it or not, hosting is not expensive at all! It is such a small investment for what you get. I use Siteground and pricing starts at $3.95/month. My website has a historic up-time of 100% (meaning no crashes or glitches), and their customer service is incredible. If you want to start a blog, hosting is one thing that you should absolutely invest in from day one. If you need help setting up your blog, here’s an easy tutorial for you! If your blog is just a hobby, then you don’t need to spend any time or money on training courses. Blog your heart out and don’t worry about anything else. But if you want to make money from your blog, you need to have a strategy for growth and monetization. Of course, you can spend hours upon hours digging through free stuff and trying to find your own way, but a helpful blogging course will take all of the guess work out of it and save you SO MUCH TIME. My biggest regret is wasting time trying to bootstrap and figure things out on my own without investing in my blog. Eventually, the free information runs out and you have to pay for the premium stuff. As soon as I made the jump and invested in some training, my business turned a corner and really took off! If you want this thing to be a real business, you have to invest in it like a real business. There are so many affordable options for training courses, you do not have to spend thousands of dollars to learn how to monetize your blog fast and efficiently. Becoming a Blogger is a comprehensive training course that will teach you how to make money from your blog in six months or less. It covers set up, growth, and monetization strategies that will jump start your blog and help you to make money from the get-go. You get lifetime access and free enrollment in the course affiliate program. If you have any questions about affiliate marketing, sponsored work, guest posting, search engine optimization, business structure, social media management, selling digital products or services, this program covers all of that and more. This course costs $97. So, after purchasing a year of hosting, a domain name, and a blogging course, your investment will be LESS THAN $160. It’s a small amount of money for the insane value you receive from these few simple resources. Do yourself a favor. Learn to automate some parts of your blogging biz so that you can have free time for more important things. When you have a money-making blog, you have to be present for your audience, filling their needs, answering their questions, and earning their trust. That can be a bit tiring when you’re just a one-man show. And this is where the beauty of automation comes in. There are plenty of tools that will help you to automatically communicate with your audience and send them valuable content every single day, so that you can focus on other parts of your business (or even go on vacation)! There are many other tools out there, but these three are FREE to start, and when the trials end, they are worth every penny of the small monthly cost. I’m not someone that will recommend going into heavy debt during the early days of your business. I’m all about spending money where it matters and making smart investments. With that said, there are a few other things that will be important to your blogging business as you grow. I definitely don’t think they’re essential for getting started or for making money, but you will want to expand your focus to a few other things in time. Prime example: Branding is important because it sets your blog apart from the millions of other blogs out there. This includes your logo, your social media graphics, the fonts and colors you use, and the pictures you share online. It should all have a cohesive look so that people know your work from a mile away. This will help you to earn trust and expand your audience. Branding does not have to be expensive either. You can purchase a simple logo on Etsy or Creative Market and you can create your own social graphics in Canva for free. As your blogging biz grows, you can put aside some cash for a high-quality logo and some professional branding, but even using a consistent color and font scheme across your social channels is a good start! You might also want to invest in some things like a quality camera, microphone, recording equipment, professional photography, etc. But in the early days, trust me: a self-hosted website and a blogging course will be your saving grace! The rest can come in time. I hope this article was helpful in pointing out the essential investments you should make when you start a blog! I’m someone that likes to keep my site and my systems very simple. I don’t believe in throwing thousands of dollars down the drain for a small hobby blog or even a side hustle. As your blog and your income grows, you will start to recognize other great investments that can take you to the next level. And that’s great! But in the beginning, all you really need is website hosting, some strategic training, and some easy automation tools! If you haven’t joined my FREE blogging group yet, you can do that here. It’s a great place for bloggers to connect, get feedback, and support each other. If you found these blogging tips helpful, please take a moment to share on social media or link to this article on your own blog! Thank you!